» A Movie Review by Walter Albert: THE BLACKBIRD (1926). 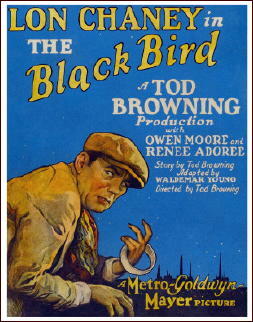 A Movie Review by Walter Albert: THE BLACKBIRD (1926). THE BLACKBIRD. MGM, 1926. 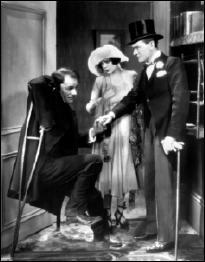 Lon Chaney, Renée Adorée, Owen Moore, Doris Lloyd. Director: Tod Browning. Shown at Cinevent 35, Columbus OH, May 2003. I had seen this film a few years ago, but the Chaney-Browning combination is always a pleasure to revisit. Chaney plays two brothers, one a crippled preacher (The Bishop) who succors the wayward inhabitants of Limehouse, the other a criminal mastermind (the Blackbird), who is the antithesis of the saintly Bishop. Chaney’s masterful dual portrayals are well supported by Moore, Adorée and Lloyd, in a complex of relationships that complement Chaney’s Jekyll/Hyde roles. The beginning is particularly striking as it displays a series of close-ups of Limehouse characters, immediately establishing the grotesque strain that is developed in Chaney’s characterizations. Editorial Comment: Shown in the photo image above are the three stars of the film, Lon Chaney, Renée Adorée, and Owen Moore. The movie has been shown on TCM; whether recently, I do not know.